This program is for men and women who are in a leadership position or who are looking to step into leadership roles in their organization and community. The Leadership Academy’s mission is to create, build and connect community leaders to provide them with the tools necessary to create positive change in the Quad Cities. This five-month program was designed to develop skills by teaching techniques and strategies for anyone sitting in a leadership position – whether you lead a department, a project, a team or just yourself. Participants meet with community leaders who share their leadership journeys and advice at each session and perform a community service project. Want to hear how local leaders were impacted by the Quad City Leadership Academy? 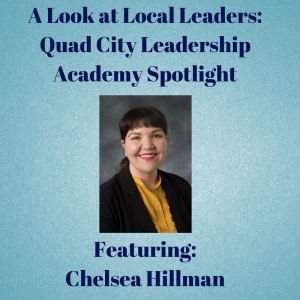 Check out our Local Leaders: A Quad City Leadership Academy Spotlight! Quad City Leadership Academy Graduate, Chelsea Hillman, shares her experience with the program and how it has impacted her! 2019 Leadership Academy is in session. Contact us to be put on the wait list for 2020! For reference, please download the 2019 Quad City Leadership Academy brochure.